This walk: 2011-10-12. River Lyd, stile, magic mushrooms, Lydford / Bridestowe-Sourton parish boundary stone, Nodden Gate, King Way Cross, Rattlebrook Peat Railway, bridge, stepping stones. We discovered that this gate actually has a dog gate built into it so that large dogs don't have to be persuaded over the stile. The next-to-bottom cross-bar in the gate has been removed to make a larger space for dogs to pass through. The Lydford/Bridestow-Sourton parish boundary stone beside Nodden Gate. 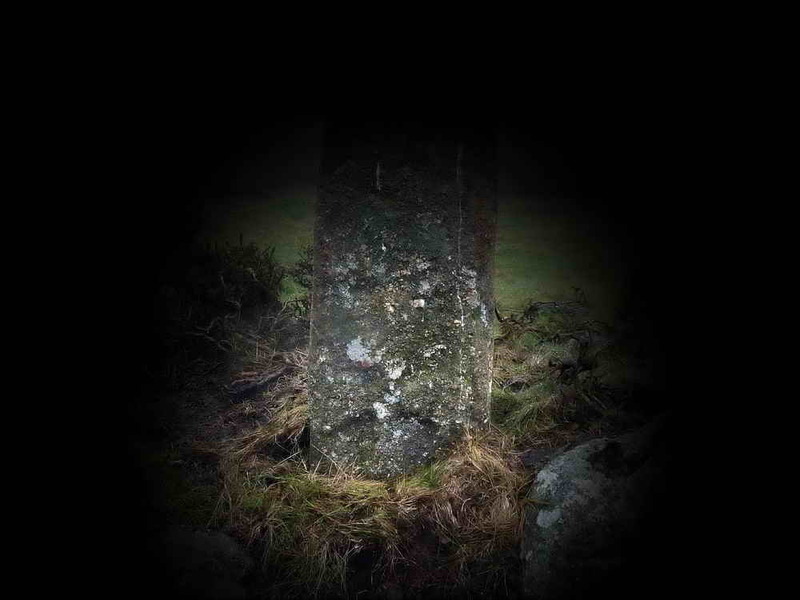 This stone had lain for many years showing 'BS' on its upper face, signifying the boundary of lands held common to the parishes of Bridestowe and Sourton. It was re-erected in August 1988 for the beating of the bounds for the newly formed Lydford parish, when it was found to bear an 'L' for Lydford on its reverse face. Source: Dave Brewer (2002) Dartmoor Boundary Markers, Halsgrove, page 174. B and S, Bridestowe and Sourton common lands. Nodden Gate (Nodden = North Down), at the top of Shortacombe Lane, which comes up from the Fox & Hounds Hotel. The boundary stone is out of sight just behind the hedge on the left of the gate. Something new - the new King Way Cross - read all about it? Believed to be early Medieval, cut in relief on just one side, broken, it is believed to have originally stood about 2 metres high. It was found by Ron's Ramblers, an ex-Dockyard walking group, in Nov. 2010. It was re-erected in August 2011 with a new base. The cross is broken and now stands at about half its believed original height. An attempt to draw attention to the cross-in-relief near the base of the structure in its present form, re-erected where it was found. Another view of the cross - it needs to be seen in early morning or evening sunlight to show shadows from the cross which highlight it. Part of the old Rattlebrook Peat Railway, here running onto an embankment down to Bridestowe and thence Lydford Junction mainline railway station (where the two main lines ran; GWR - Great Western Railway and LSWR - London & South Western Railway). The peat railway was horse-drawn for most of its existence, built by the West of England Compressed Peat Company in 1877. It failed several times after various attempts to make it a success. A petrol-driven lorry was converted in Okehampton to run on the rails, but its last job was dig up- the rails when the line closed in 1931. Another attempt was made in 1936 and it ran with road wagons until final closure in 1955. Looking across the King Way track at the Rattlebrook Railway going up to the peat works. Looking along the King Way, the old royal mail route in the time of King Charles I, being the quickest way between Okehampton and Tavistock, staying on quite high ground, mainly following the contours. Jess, coming back at a rate of knots; similar photo taken near Dartmeet, 16 Feb. 2011 (by Jim). 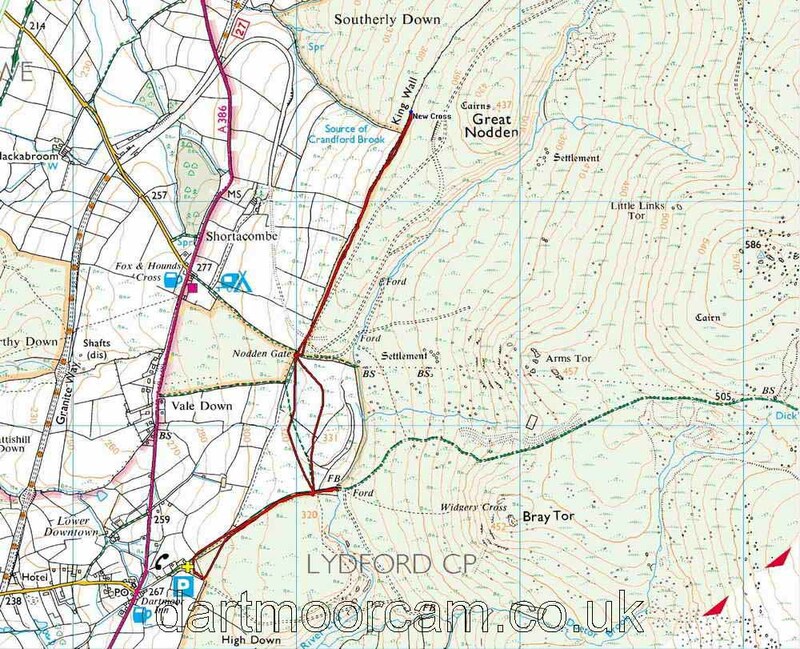 This walk was accessed by parking up the lane just past the Dartmoor Inn (travelling from Tavistock) on the A386, at the P symbol / yellow cross on the map.